Having finished up with The Legend of Zelda: Twilight Princess HD, and being totally obsessed with Zelda because of Hyrule Warriors Legends, I have decided to finally begin a replay of The Legend of Zelda: Skyward Sword. Will I see it through to the end? Oh yeah, most likely. Unlike RPGs, more action-oriented games generally hold my attention all the way through on a replay. I have also decided that I will take some time out to reflect on the game each week, as despite being one of my most anticipated games ever and having enjoyed it quite a lot, Skyward Sword really didn’t leave a very lasting impression on me. I could tell you every plot beat and plenty of pointless trivia from nearly every other Zelda game, but my memories of Skyward Sword are mostly blurry and full of holes. To call this “Week 1” might be a bit of a misnomer, as it’s really just “Day 1” if I’m going for full disclosure. It was a very full day though! I played for like six hours! As soon as I gained control of Link, the first thing I wanted to do was to remove the control overlay on the HUD. There was no option to do this, and I was quite displeased, as it takes up a lot of screen real estate. The right side of the screen is covered in a huge Wiimote diagram, and there’s a nunchuk display on the bottom left. It’s really ugly and distracting. Fortunately, after the intro stuff was over and the adventure proper began, I was given the option to reduce the control layout to a smaller, more traditional display. There’s even an option to turn it off entirely, which is very thoughtful! 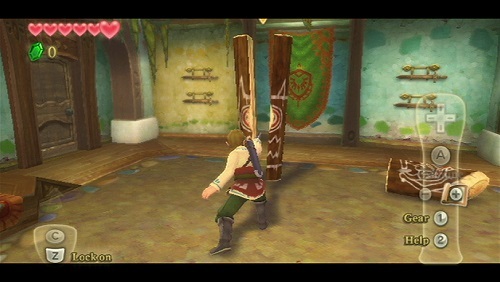 Speaking of controls, Skyward Sword was built entirely around motion controls, which put off a lot of players. They really don’t bother me, but I can understand how having to move slightly could be a deterrent to your average Gamer. What does make the motion controls a problem is that they are so tightly woven into the game that it would be nearly impossible to re-release it with normal controller support. So that means no Skyward Sword HD, which is too bad, because the game’s art style is gorgeous and would be mind-bogglingly beautiful with a high definition remaster. But hey, being sad because I won’t get to pay $80 for a prettier version of a game I already own is a very first world kind of problem. One of the biggest black marks on Twilight Princess’ reputation is that the time between the start of the game and the first dungeon is very long and slow. It’s really not as bad as the internet would like you to think, but it does get going at a very leisurely pace. Skyward Sword also has a fairly extended intro sequence, though savvy players can probably burn through it pretty quickly. I took about two hours to get to the surface, but I plodded along, taking time to get reacquainted with Skyloft and its citizens. I even chased Beedle’s ship shop around for a while trying to get on board before I was supposed to (I failed). Back to Twilight Princess again for a moment: that game has really incredible cutscenes. The huge range of facial expressions for all the characters, they way that so many of them have tons of unique animations, and overall excellent direction. It’s really very satisfying to watch the story in Twilight Princess unfold, and even though you are allowed to skip the cutscenes, I never do because I find them such a joy to watch. And for years I thought that this was unique to TP. Not exactly! Skyward Sword does a lot of these things too, but to a lesser extent. Link, Zelda and Groose are all very animated and expressive, though most of the other characters are a little more stiff. Zelda in particular is very lovable in this game, and luckily, most of the scenes in the first act focus on her. As far as gameplay is involved, I do quite enjoy how the “field” sections are basically just wide-open dungeons that lead into the more traditional temple-style dungeons. I wandered around Faron Woods for quite a bit longer than I needed to, just learning the lay of the land and hunting for secrets. This being a Zelda game, of course, many of said secrets are currently inaccessible because I don’t have bombs or whatever it is that lets Link dive underwater. The Kikwis are cute. 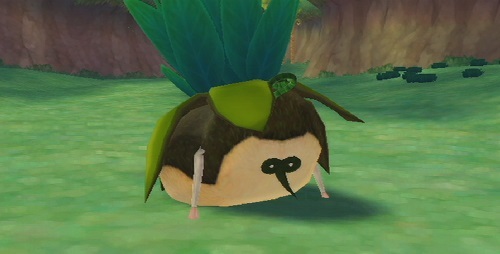 I like them better than Deku Scrubs and Kokiri as the forest-dwelling people, but they’re not quite as adorable as the jingly little Koroks. Goddess Cubes are an interesting distraction. They are black blocks that, when hit with a Skyward Strike, make a treasure chest appear somewhere up above the clouds. It’s kind of like finding treasure charts in Wind Waker, but less exciting. In the end, they’re just another thing that you’ll be combing old areas for once you get a new tool. Might have been better to cut out the middleman and just hide treasure chests instead. At least you eventually get the ability to dowse for them. Speaking of which, dowsing is a handy feature, but why does the game keep insisting that I use it every ten steps? Like, let me just run around and explore. We’re not on a time limit here, so it’s not critical that I beeline to the goal as fast as possible. Though Fi isn’t being as overly intrusive as people like to claim. She doesn’t pop out any more often than Midna, and so far I’ve been able to ignore all of her “Hey! Listen!” jingles without any forced interruptions. I’m beginning to think that folks on the internet might like to blow things way out of proportion. This is running pretty darn long now, so let’s just touch on one last thing: Skyview Temple. It is incredibly short and easy, as you might expect a game’s first dungeon to be. But take a moment to look back on the first dungeons in other Zelda games… Dragon Roost Cavern, TP’s Forest Temple, Woodfall Temple, even the Deku Tree. All of these first dungeons are significantly more complex and bigger than Skyview. It’s not a terrible dungeon if you take it on its own terms, but it really pales in comparison to its peers, and is fairly unsatisfying. On the other hand, it’s got the absolute hardest first boss in the series: a duel with Ghirahim. He’s not too tricky if you’ve figured out sword combat and how to parry with a shield, but I can see many a player getting stuck and giving up at this point. It’s a great fight that eschews the usual Zelda tradition of “use the dungeon tool to stun the boss, sword him, repeat twice more” in favour of a truly intense one-on-one duel. Alright, so. It turns out that I have a few more thoughts about Skyward Sword than I’d expected. Imagine that! It’s a complex game, and there’s a lot to go over. I might have to start paring down my thoughts so that these things aren’t just massive walls of text.